The first rule of Dunning-Kruger Club is you do not know you’re in Dunning-Kruger Club. The fundamental cause of trouble is that in the modern world the stupid are cocksure and the intelligent are full of doubt. Successful people often talk about having impostor syndrome. A sneaking feeling that they just can’t shake that makes them doubt their own accomplishments. Sometimes this feeling of doubt is even accompanied by a persistent fear that they will be found out, labeled a fraud. In these dreams, there’s been a mistake, and everything they’ve worked for is taken from them. Because it was never meant for them anyway. “I know, I know,” they say. They continue having those doubts anyway (because the doubts are persistent little buggers), but press on. Because they know that one of the oddest phenomena surrounding how we tend to socially compare and form our self-concepts explains what’s going on: Dunning-Kruger effect. 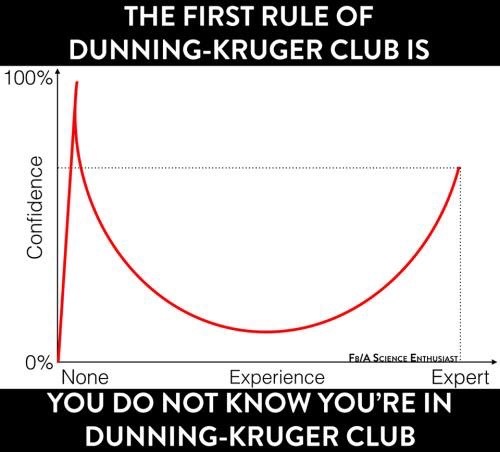 But Dunning-Kruger effect is a little different. It’s very well known for a psychological finding. I mean, it even has its own memes. So what is Dunning-Kruger effect anyway? It’s basically what Bertrand Russell was complaining about in the above quote. Simply stated, Dunning-Kruger effect is a cognitive bias whereby the most unskilled or incompetent individuals think they are much better at things than they actually are. They also discovered that intelligent, competent individuals are more likely to make a mistake in the opposite direction and underestimate their own abilities. Typically, experts do not recognize the full extent of their skills but instead rate themselves perhaps a little above the average person (but not much), often rating themselves below where the incompetent folks would rank their own abilities. So when competent people begin to receive external validation that matches the extent of their own skills, many of them feel like they don’t deserve it. It plays games with their heads. They feel like impostors. This is why Maya Freaking Angelou has impostor syndrome. In some respects, Dunning-Kruger effect is a pretty frustrating and depressing phenomenon. No one wants to deal with overconfident amateurs, especially ones who spew falsehoods without a shred of doubt. And it’s a sad thought that skilled people often doubt themselves. Confidence in other people can be attractive, but don’t fall prey to mistaking it for competence. I get people wanting to put their best foot forward (and even though I’m personally plagued by doubts, I really do try to be calm and self-assured around people, particularly when I’m first meeting them), but if a person seems completely incapable of modesty? Well, it gives me pause. It’s not normal for a skilled person to be fully confident. They typically know the limits of their knowledge and their abilities. And the areas they need to work on. If someone doesn’t seem to grasp those things, I’m unlikely to trust their self-assessments. If you are experiencing impostor syndrome, it paradoxically means that you probably deserve the success you’re meeting with. The doubts are obnoxious as hell, but they’re also a great sign that you are probably very talented indeed. I’ll say it one more time: Maya Freaking Angelou has impostor syndrome. This was a great read. Impostor Syndrome is something I struggle with in my professional and some of my personal areas of life. This line in particular, “Confidence in other people can be attractive, but don’t fall prey to mistaking it for competence,” resonated with me, as I have tried to let people know that indeed the people they hire may be super confident but that does not mean they’re competent and able to do the work! Are You a High Self-Monitor?